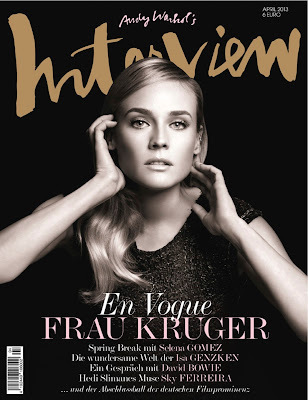 The April issue of German 'Interview' hit newsstands last Wednesday, featuring a split cover. Readers can choose between a cover of Sky Ferreira and one of Diane Kruger. Sky Ferreira, muse to Hedi Slimane, owes the start of her career to Michael Jackson. These days, she earns her living as the face and body of Saint Laurent, shoots Videos with Terry Richardson, smokes pot with Snoop, and celebrates Christmas with Elton John. Diane Kruger was a ballerina before turning to French cinema as a model. Her new film, “Un plan parfait” (“A perfect plan”) with Dany Boon, came to movie theaters this week. Also in the April issue of German “Interview”: Isa Genzken meets Dominic Eichler in the run-up to her retrospective at the MoMA; Haider Ackermann talks to Balthus’s widow, Setsuko Klossowska de Rola; James Franco spills details on his latest film, “Interior. Leather Bar”; Kendrick Lamar thinks times have changed in gangsta rap.